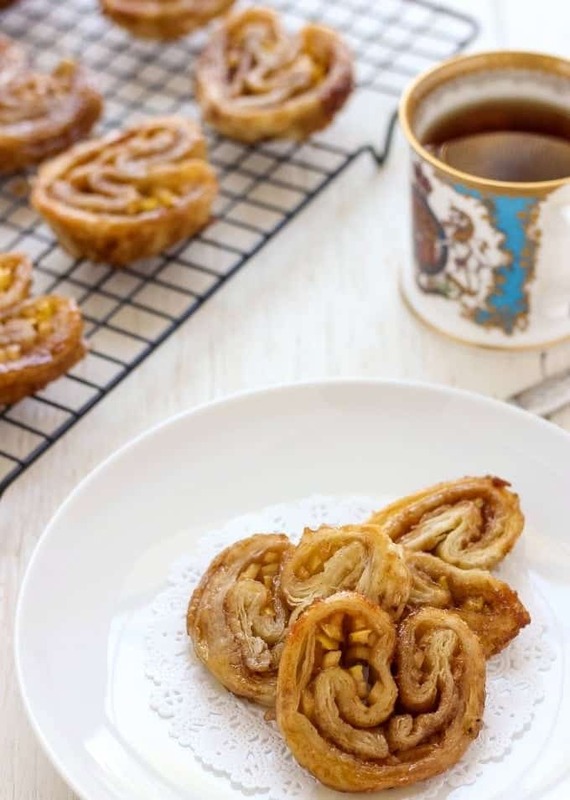 French Palmiers are a crispy little treat that is made in no time. It is a perfect dessert that requires minimal ingredients and always tastes great. I absolutely adore puff pastry. It is so versatile and whatever ingredient you want to put in there, it always tastes great. Today’s recipe is a very simple, delicious, goes really fast and uses my favorite puff pastry. Lately, I’ve been exploring more and more French recipes and stumbled across this simple Palmiers recipe. Why simple? Because the basic recipe requires just 2 ingredients: puff pastry and sugar. Why not to take it up a notch? I added a little bit of cinnamon for a pungent scent, orange zest for some zingy flavor and taste and an apple for the extra crispiness and sweetness. All of these ingredients in a combination with puff pastry created a lovely dessert pulled off in under 30 minutes. Today’s recipe is also quite special. My blogging friend Jenna from A Savory Feast has just recently had a baby, And to celebrate her little bundle of joy, me and a couple of my other blogging pals decided to throw her a virtual baby shower. Preheat the oven 400 F.
In a small bowl, combine sugar, orange zest and cinnamon. Mix well. On a working surface, sprinkle half of the sugar mixture. Lay a sheet of puff pastry on top of sugar. Sprinkle the remaining of sugar mixture on top of puff pastry. Using a rolling pin and applying a little pressure roll sugar into puff pastry. 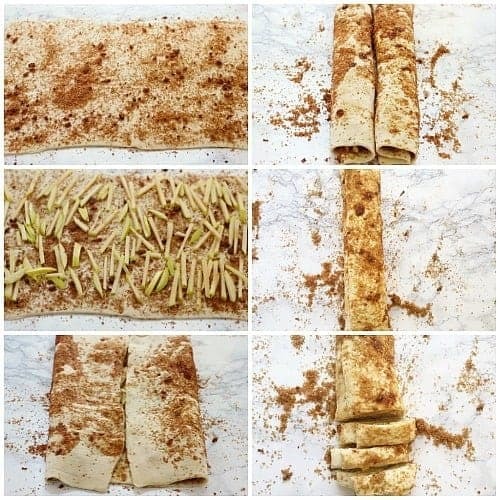 Lay apple strips all over the sheet. Fold in 2 opposite shorter sides of puff pastry to meet in the centre. Fold in both of the sides again. Carefully fold one side over the other and cut into ½ - inch thick slices. Place on a parchment lined baking dish and bake for 12 minutes. Then turn over to the other side and bake for another 5-6 minutes. Cool on a cooling rack. 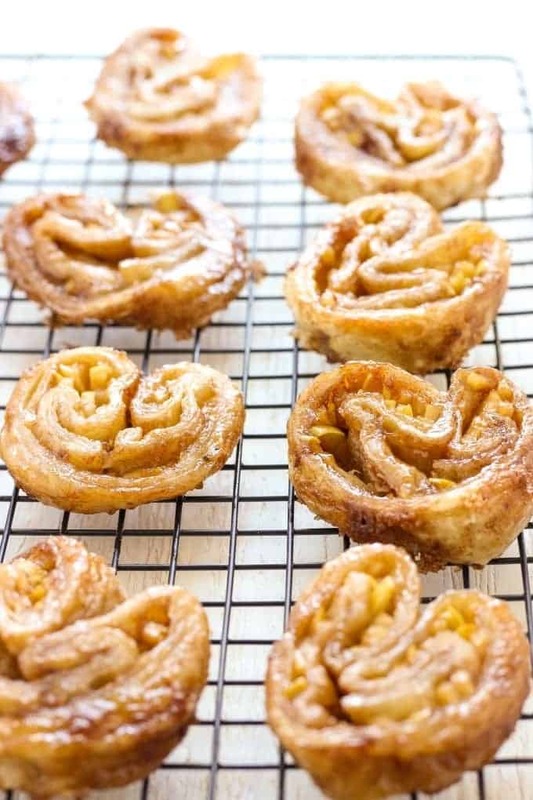 The recipe modified from Palmiers by Anne Burrell. Having a baby is an excellent occasion for creating beautiful and mouthwatering food. So here are all the recipes from Jenna’s virtual baby shower. Make sure to check them out. I don’t think I’ve ever tried palmiers! They look so tasty. Thanks for being a part of this wonderful surprise baby shower! I was so excited to see this today. You’re welcome Jenna! Congratulations again on your little bundle of joy!